Tooth dilaceration is a dental anomaly characterised by a change in orientation of the root of a tooth often in the labiolingual or mesiodistal direction. Maxillary incisor dilaceration is relatively rare and estimated to occur in up to 1% of all permanent dentitions., Where a severe dilaceration is present, surgical extraction and subsequent replacement used to be the first choice of treatment. However in recent reports, orthodontic-surgical treatment of impacted maxillary incisors is generally successful but with a relatively long treatment duration as treatment usually commences in the early mixed dentition.,, However, there remains the risk of failure due to an intractable position, ankylosis, external root resorption and root exposure after orthodontic traction., The presence of significant tooth dilaceration is a clinical challenge and often requires the need for multiple surgeries to enhance effective traction and to improve gingival aesthetics.,, The most common orientation of a dilacerated maxillary incisor is with the crown directed upward and labially.,, To date, there are no reports of successful orthodontic traction of a dilacerated maxillary incisor with the crown directed towards the palate with the root directed labially. A case of a dilacerated central incisor with a 90° crown-root angulation and palatally displaced crown is presented herein. Using a single stage open window exposure of the crown on the palatal aspect with light orthodontic traction force, the impacted dilacerated central incisor was moved into its proper position. The central incisor remained vital and the crown of the tooth was successfully positioned in alignment with the contralateral incisor. An 18-year-old Chinese male accompanied by his parents sought a consultation at the National Dental Centre Singapore. Their chief concern was an unerupted upper right central incisor (#11) resulting in an unaesthetic anterior space. The patient had no relevant medical history and was otherwise healthy. He did not recall any prior history of trauma to his front tooth. Intra-oral examination showed that he was disease free but he also presented with a submerged lower left deciduous second molar. The patient had a Class I malocclusion on a mild skeletal III base. He had upper moderate spacing due to an impacted and dilacerated upper right central incisor. The space at the upper right central incisor was reduced at 5.5 mm [Figure 1]. The analysis of the lateral cephalometric radiograph confirmed a mild skeletal Class III relationship [Figure 2]. 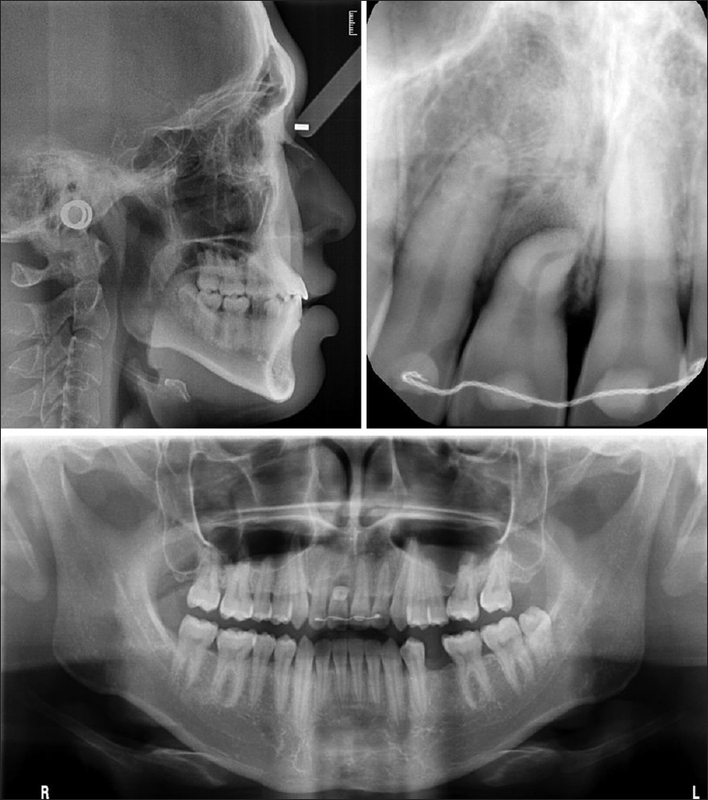 The panoramic radiograph demonstrated an impacted maxillary right central incisor and a submerged lower left deciduous second molar with a missing lower left second premolar successor [Figure 2]. The angle between the root and the crown of the central incisor was found to be dilacerated on the lateral cephalometric radiograph at approximately 90°. The crown of the tooth was displaced palatally with the root displaced labially and out of the alveolar housing as seen on the cone beam computed tomography (CBCT) [Figure 3]. The root length measured as the perpendicular distance from the cementoenamel junction to the apex of the root using the Simplant Pro 17.1 software is 8.2 mm [Figure 3]. Maintain the space at the lower left second premolar site for a future implant replacement. Surgical exposure, orthodontic space opening and traction of the impacted dilacerated central incisor into proper position. With regards to option 2, the patient and parents were informed of the possibility of a failed traction of the dilacerated central incisor due to ankylosis, severe mobility due to lack of alveolar support as the tooth was out of the alveolar housing, external root resorption and the loss of tooth vitality. After informing all possible treatment alternatives, the patient chose to try to save the tooth and bring it into proper position. They were informed that should the tooth be ankylosed and not amenable to orthodontic traction, the excision of #11 and replacement with a bridge or an implant at a later stage was still a viable option. Phase I of the treatment was to create sufficient space for the traction of the impacted incisor. The submerged deciduous lower second molar was found to be ankylosed and had to be surgically excised. The removal of the deciduous tooth was performed to allow continued vertical development of the alveolus. This occurs from bone apposition that occurs on top of the interdental septum of adjacent non-ankylosed permanent teeth via forces from both the periodontal and gingival fibres. Once adequate space was achieved, the patient was referred to the oral surgeon for an open exposure of the impacted incisor. An open window exposure of the labial surface of the crown on the palatal side was performed. A button was bonded to the labial surface of the crown a week after the exposure. Light orthodontic traction using the powerchain from #11 button to an upper 0.018 inch stainless steel archwire was initiated. Once more of the #11 crown was visible, a bracket was bonded and further traction was performed using a piggyback 0.014 inch nickel-titanium archwire on a 0.018 inch stainless steel base archwire. Rectangular archwires with palatal root torque were placed to move #11 root palatally [Figure 4]. Tooth vitality tests were performed every 3 months and the tooth #11 responded normally. The impacted and dilacerated right maxillary central incisor was successfully positioned into proper alignment through a single stage crown exposure and orthodontic traction. As the crown of the tooth was moved buccally, there was insufficient buccal cortical bone which resulted in a transient buccal recession as seen in [Figure 4]. Palatal root torque was applied gradually to position the tooth root back into the alveolus which improved the gingival contour and reduced the amount of buccal recession on the tooth. The tooth also had prominent mammelons [Figure 4] and was extruded gradually to allow for enameloplasty of the incisal edges to improve the aesthetics and further helped to reduce the amount of buccal recession. The tooth had acceptable gingival contour with sufficient attached gingiva, hence no further soft tissue grafting procedures were indicated [Figure 5]. The crown of the tooth was positioned in its ideal position with respect to the contralateral central incisor [Figure 6], while the root of the dilacerated central incisor was positioned palatally [Figure 7]. The tooth remained vital, responding normally to pulp tests. On the periapical radiograph [Figure 6], the incisor reveals a shortened root due to the 90° crown-root angulation. On the periapical radiograph as well as the orthopantogram there is a radiolucent area at the apical portion of the root, this is consistent with the lack of cortical bone on the buccal aspect of the tooth as the root is positioned palatally. The lack of buccal cortical bone on the apical aspect can be seen as a buccal defect on the intra-oral photographs in [Figure 6]. 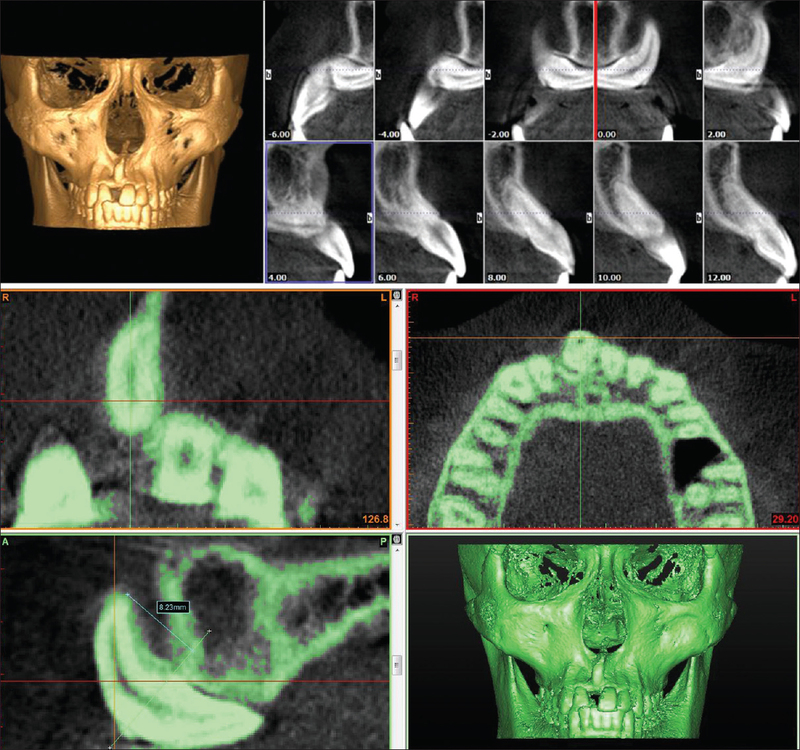 The post-treatment CBCT [Figure 7] shows that there was mild root resorption of the dilacerated central incisor. 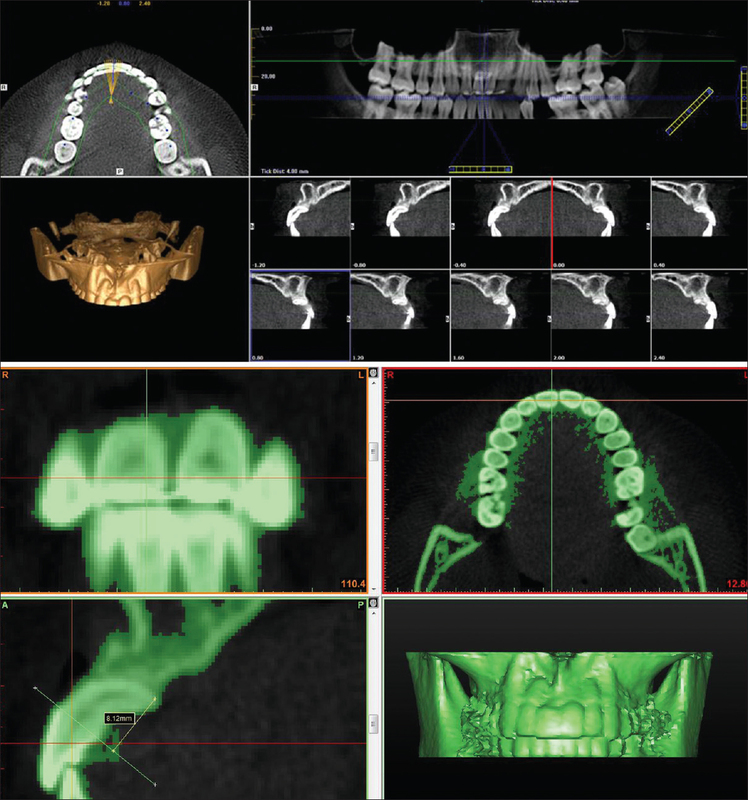 The post-treatment root length measured as the perpendicular distance from the cementoenamel junction to the root apex using the Simplant Pro 17.1 software is 8.12 mm [Figure 7]. Clinically, the tooth has normal mobility as compared to the adjacent incisors. The tooth has been asymptomatic and pulp testing showed a vital pulp at the 1-year follow-up. A traumatic force transmitted through the deciduous tooth root to the developing tooth germ can cause the crown of the unerupted permanent incisor tooth germ to rotate upwards in its crypt and also damage the root-forming cells of that tooth. This results in a change in orientation of the crown. However, subsequent root development continues in the same direction as before the trauma, resulting in the development of a dilacerated tooth, which usually becomes impacted., The most common presentation of a dilacerated incisor is with its crown lying horizontally and the root developing vertically, so that when the tooth is properly positioned, the tooth root will be pointing labially. In this case, there is a palatal displacement of the crown which may be due to a more palatal position of the tip of the developing permanent incisor relative to the apex of the deciduous incisor root at impact. Most orthodontists believe that the aetiology of a dilacerated incisor is due to trauma. However, other aetiologic possibilities do exist and the exact cause may not be fully understood., Stewart investigated 41 cases of dilacerated incisor and found that trauma accounted for only 9 cases (22%). No case was found with both central incisors involved, nor was there damage to the neighbouring teeth, which could be expected to occur in at least a few instances if trauma were the cause. Furthermore, the cases also failed to show two distinct and angulated portions to the root but rather a continuous and tight curve which was different from the cases where trauma was an aetiologic factor. In the case presented, the patient had no prior recollection of trauma, the root morphology of the #11 also showed a continuous C-shaped curve with intact adjacent incisors. This suggests a possibility that the aetiology may be related to an ectopic development of the tooth germ as well as a vertically directed force that affects the palatal aspect of the mineralising root. Orthodontic-surgical treatment of impacted maxillary incisors is generally successful but with a relatively long treatment duration.,, As treatment usually commences at the mixed dentition stage, the patient often requires a second stage of comprehensive orthodontic treatment during the permanent dentition stage. Although most cases in the literature show successful results in the younger age group, this case shows that orthodontic-surgical management of a dilacerated incisor can also be successfully performed at an older age. Furthermore, since treatment commenced in the permanent dentition stage and the patient was in his late teenage years, treatment could be carried out in a single stage and hence the treatment duration of 2 years and 10 months was within normal limits. Due to the patient's straight facial profile and minimal crowding, an extraction treatment plan was contraindicated which leaves the option of a replacement either with a prosthetic tooth or with his natural tooth. Since the patient was still a few years shy of being skeletally mature for an implant, the option of aligning the impacted dilacerated incisor was reasonable. Should the treatment fail and excision of the impacted tooth was required, a simultaneous bone graft and socket preservation technique could be employed to ensure a better bone volume for the subsequent implant. The successful treatment of an impacted dilacerated tooth is thought to depend on the stage of root formation, the degree of dilaceration and the position of the tooth.,, In this case, the root was fully formed with a 90° crown-root angulation. At the start of treatment, the root was displaced out of the alveolar housing and was palpable from the labial aspect. The proper alignment of the tooth crown brought the root palatally. Radiographically, the root is palatally placed with mild root resorption but clinically the tooth is non-mobile, though the root is mildly palpable on the palatal aspect. Once the tooth crown was visible, tooth vitality was tested and the tooth responded normally to all pulpal tests. This gives us an understanding of the plasticity of the neurovascular bundle that it can be remodelled with the application of orthodontic forces without loss of pulp vitality. As most impacted maxillary incisor crowns are displaced labially and often close to the floor of the nasal cavity, the most common technique employed is a closed eruption technique as it is difficult to erupt such teeth through the midcrestal area by using only lingual button orthodontic attachments. The amount of keratinised gingiva surrounding the exposed crown, the location of the incisal edge of the inverted crown and its relationship to the mucogingival junction are factors that help determine the type of flap technique. A single stage open window technique was employed in this case as the tooth crown was displaced palatally with a layer of keratinised mucosa covering the tooth crown. It has been suggested that an open window technique might lead to gingival scarring or increase the clinical crown length. However, due to the presence of keratinised mucosa from the palate; this was not observed in this case. This case report described the successful utilisation of a single stage open window technique and orthodontic traction of an unusual dilacerated maxillary central incisor. It demonstrated that a dilacerated root can be moved orthodontically at an older age without loss of pulp vitality and the neurovascular bundle remodels as the tooth is moved orthodontically. At the 1-year follow-up, the tooth was asymptomatic, vital and periodontally healthy. Hamasha AA, Al-Khateeb T, Darwazeh A. Prevalence of dilaceration in Jordanian adults. Int Endod J 2002;35:910-2. Malcic A, Jukic S, Brzovic V, Miletic I, Pelivan I, Anic I. Prevalence of root dilaceration in adult dental patients in Croatia. Oral Surg Oral Med Oral Pathol Oral Radiol Endod 2006;102:104-9. Chaushu S, Becker T, Becker A. Impacted central incisors: Factors affecting prognosis and treatment duration. Am J Orthod Dentofacial Orthop 2015;147:355-62. Ho KH, Liao YF. Predictors of surgical-orthodontic treatment duration of unilateral impacted maxillary central incisors. Orthod Craniofac Res 2011;14:175-80. Farronato G, Giannini L, Galbiati G, Maspero CA. 5-year longitudinal study of survival rate and periodontal parameter changes at sites of dilacerated maxillary central incisors. Prog Orthod 2014;15:3-8. Boyd RL. Clinical assessment of injuries in orthodontic movement of impacted teeth. II. Surgical recommendations. Am J Orthod 1984;86:407-18. Wei YJ, Lin YC, Kaung SS, Yang SF, Lee SY, Lai YL. Esthetic periodontal surgery for impacted dilacerated maxillary central incisors. Am J Orthod Dentofacial Orthop 2012;142:546-51. Vanarsdall RL, Corn H. Soft-tissue management of labially positioned unerupted teeth. Am J Orthod 1977;72:53-64. Singh GP, Sharma VP. Eruption of an impacted maxillary central incisor with an unusual dilaceration. J Clin Orthod 2006;40:353-6. Vermette ME, Kokich VG, Kennedy DB. Uncovering labially impacted teeth: Apically positioned flap and closed-eruption techniques. Angle Orthod 1995;65:23-32. Miloglu O, Cakici F, Caglayan F, Yilmaz AB, Demirkaya F. The prevalence of root dilacerations in a Turkish population. Med Oral Patol Oral Cir Bucal 2010;15:e441-4. Malmgren B. Ridge preservation/decoronation. J Endod 2013;39(3 Suppl):S67-72. Betts A, Camilleri GE. 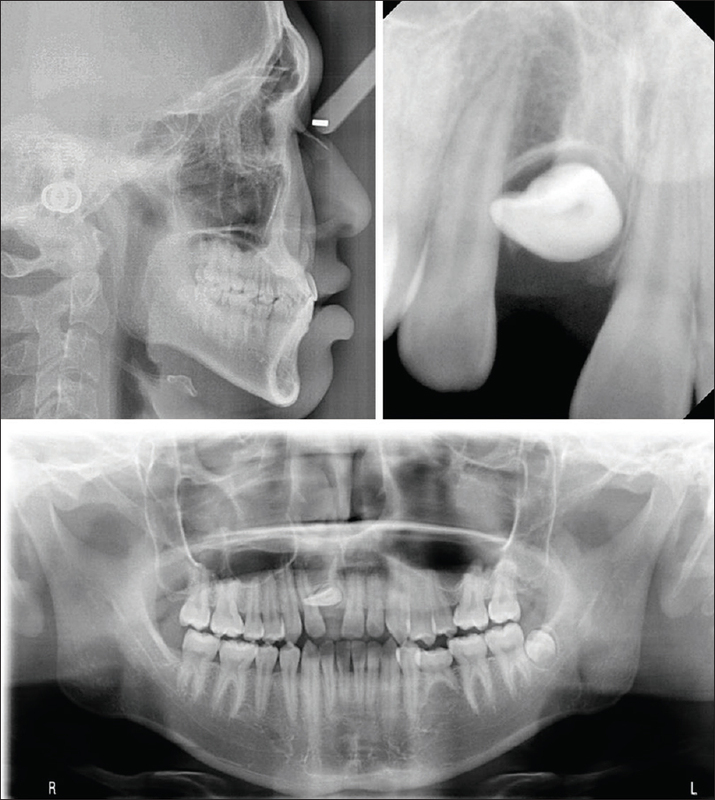 A review of 47 cases of unerupted maxillary incisors. Int J Paediatr Dent 1999;9:285-92. Becker A. The Orthodontic Treatment of Impacted Teeth. 3rd ed. Oxford, United Kingdom: Wiley-Blackwell; 2012. Smith DMH, Winter GB. Root dilaceration of maxillary incisors. Br Dent J 1981;150:125-7. Stewart DJ. Dilacerate unerupted maxillary central incisors. Br Dent J 1978;145:229-33. Chew MT, Ong MM. Orthodontic-surgical management of an impacted dilacerated maxillary central incisor: A clinical case report. Pediatr Dent 2004;26:341-4. Tanaka E, Hasegawa T, Hanaoka K, Yoneno K, Matsumoto E, Dalla-Bona D, et al. Severe crowding and a dilacerated maxillary central incisor in an adolescent. Angle Orthod 2006;76:510-8. Topouzelis N, Tsaousoglou P, Pisoka V, Zouloumis L. Dilaceration of maxillary central incisor: A literature review. Dent Traumatol 2010;26:335-41.